I am writing to comment on the Draft Feasibility Report and Integrated Environmental Environmental Assessment for the Lower Pool 4 Dredged Material Management Plan. The City of Alma is opposed to to those parts of the Plan referring to on-shore management of dredged material. The Environmental Assessment component of the report serves the function of Draft Environmental Assessment under the impact evaluation process of the federal National Environmental Policy Act (NEPA). It is the City’s position that its concerns require coordination between the City and the Corps. The City requests hereby that meetings, as required, be held to discuss the issues we present in this letter and participation by the City in appropriate revisions to the Plan and the determination of mitigation measures. It is our expectation that these meetings in addition to substantial resolution of the concerns raised therein will occur before the issuance of a Finding of No Significant Impact, which would conclude the NEPA environmental review process. No mention of the traffic effects of the Plan on Beach Harbor Road in Alma is made in the Plan. This is a narrow City street not built to the standards of State Roads. Beach Harbor Road floods periodically, further weakening its structure to high loads. In 2014 the corps unloaded some 600,000 cu. yds. from Grand Encampment Island. All of it was carried across Beach Harbor Road, one dump truck at a time, 80,000 times. The road was damaged and repairs made. Now the repairs need repairs. The Plan’s annual projections of trips may well finish off this road. The proposed truck traffic through the center business district during the short tourist season is dangerous for increased pedestrian traffic from visitors. State Road 35 is narrow and congested with the comings and goings of on-street parking. The proposed annual 11 day ritual of 10 hour days, five days a week, dump truck traffic through the commercial district will add noise during the short tourist season, making the businesses there less appealing to customers. This same ritual will pass into and out of the Alma Marina Site. The 90 degree turn from Beach Harbor Road to the On-Shore Transfer Site at Alma Marina will create significantly disturbing noise for slip renters at the Alma Marina. This turn is a low speed transition from gravel to pavement and requires heavy braking and acceleration for each use. In addition, a double track crossing of the BNSF occurs nearby, with noise from the uneven surface, increasing the noise level at the Marina further. Cultural Resources must include the National Historical District that includes most of the City center area the Plan’s truck traffic will pass. There are several individual properties listed as National Historic Properties along the route as well. These are all ignored in the Plan. Under Section 106 of the Historical Preservation Act, detailed regulatory and associated mitigation requirements need to be determined subsequent to the National Environmental Policy Act (NEPA) review which this Plan is part of. The businesses and residents along State Road 35 in Alma and on Beach Harbor Road in Alma are the most exposed to hardship under the Plan. They deserved early and direct notice of the Plan in the same way that the owners of the property to be acquired received it. They received none. 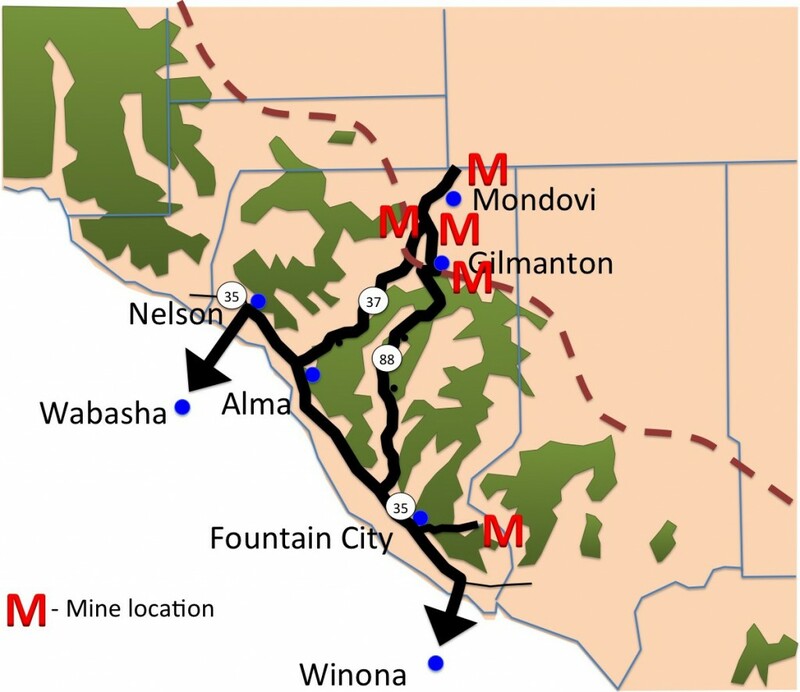 The use of Alma as Wisconsin terminal is assumed in the Plan. 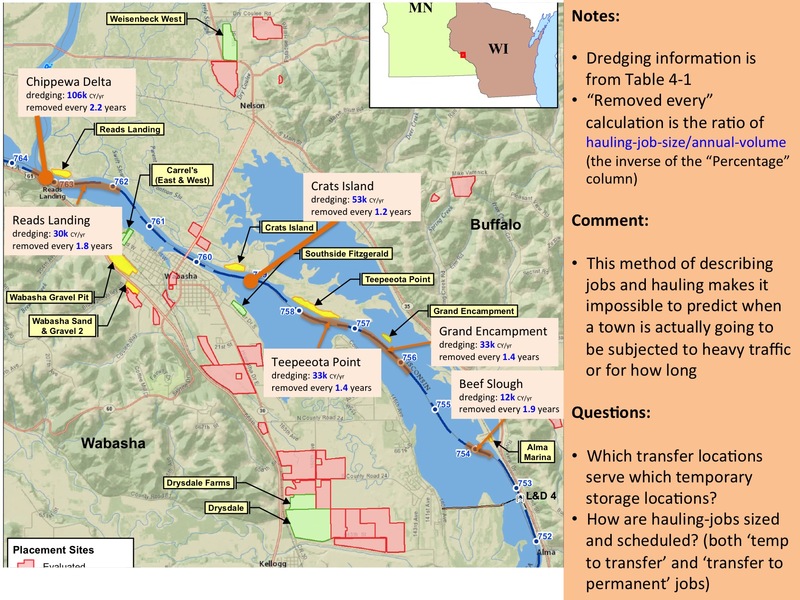 Given the supposed efficiency of barge hauling of bulk materials, it is obvious that basing the costs of hauling sand from dredge to disposal site by considering only ton mile costs for dump trucks ignores other, perhaps more economical, solutions. 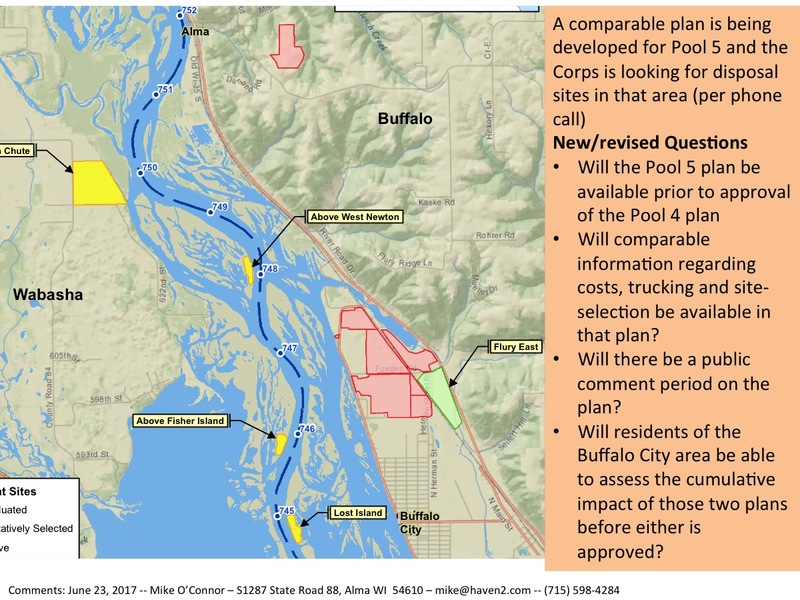 Alternative terminal sites in Pools 5, 5A, and 6 need to be evaluated. Hauling to the Flury West Site, for example, is possible from Pool 5. In this case, the truck portion of the trip becomes measured in feet, not miles, and the barge run increased by about 7 river miles. Other disposition sites close to potential offload sites may exist in these lower Pools, as well; but none have been explored in the Plan. They should be. The City of Alma lacks staff and resources to fully analyze the voluminous Plan presented by the Corps in the time given by the Corps timetable. The points above are a start. I urge the the Corps to extend the time available comment to permit such analysis. Major parts of the Plan seem to be driven by convenience to the Corps rather than minimizing the impact of the project on local residents and local governments. A more thoughtful Plan could address both goals. 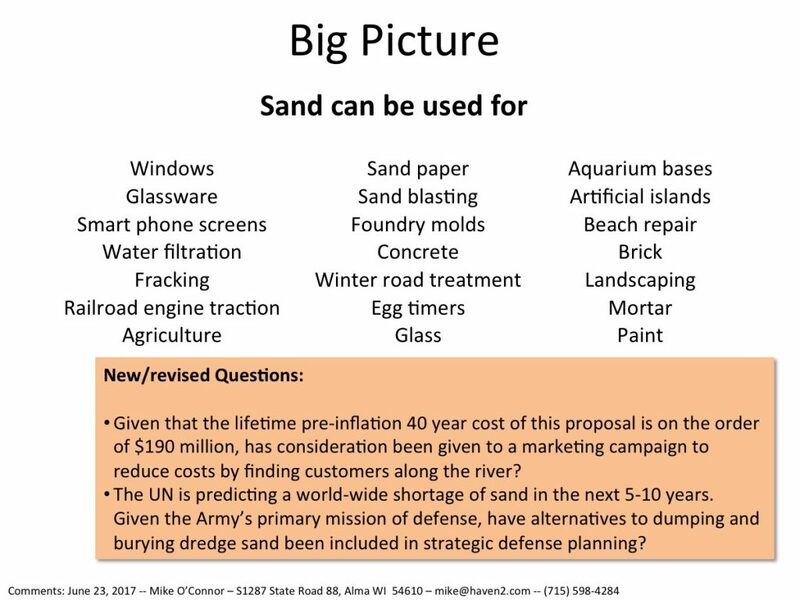 The Plan covers sand that will be coming down the Mississippi for the next 40 years and will be dredged over the next 40 years. The Plan, however, insists that all of the land needed for disposal must be acquired NOW. The Plan rejects one favorable site because it will not become available for five years, long before the 40 years are over. The Plan also rejects smaller sites that could be used for a year, or two or three because they are not large enough to accommodate a 40-year project. Insisting on acquiring all of the land immediately pushes the Corps into looking at only the largest sites. Drafting a Plan that matches the timing of acquiring and using land with the annual need for disposal would require more thought and planning by the Corps. However, that deeper analysis would allow for the use of smaller sites, using each of those sites over a shorter period of time, and restoring each of them more quickly – all of which would reduce the impact of the project on local residents and local governments. The Plan says that every site will be used every year, each will be filled at a uniform rate, and a site will not be covered and reclaimed until it is filled at the end of 40 years. As noted earlier, if smaller sites were selected (many of which are already disturbed) they could be opened, filled and reclaimed in a year or two reducing the community impact substantially. The planning process, however, for the Corps would be more difficult. The remark by the Corps representative at the Nelson public hearing about the Fitzgerald property was telling. “You turn off 61 onto the county road and the farm is right there.” He didn’t say it, but if you turn north from Nelson the Weisenbeck farm is right there the first one on the right. If you go south from Alma the Flury farm is right there the second one on the right. It appears that not much effort went into the search for alternative sites. The criteria for selection are not clear and seem to be applied inconsistently. Several sites were rejected because they were too costly, yet at least one of the selected sites has a higher cost than sites rejected for being too expensive. Likewise several sites were rejected as being too small, but at least one of the sites selected is smaller than sites rejected for being too small. The Plan says that use of the dredge material for habitat construction was ruled out because “there was very little interest expressed” by the state agencies involved. However, that option might be reconsidered if “agencies’ goals change”. Someone in authority should tell the state agencies involved that their goals need to change. The draft Plan purports to compare the effects of carrying out the Plan with the effects of “doing nothing”. The Plan goes to some length to identify doing nothing with continuing present practices. Numerous times throughout the report, however, the Corps says the effects of continuing present practices are “unknown at this time” making any comparison meaningless. 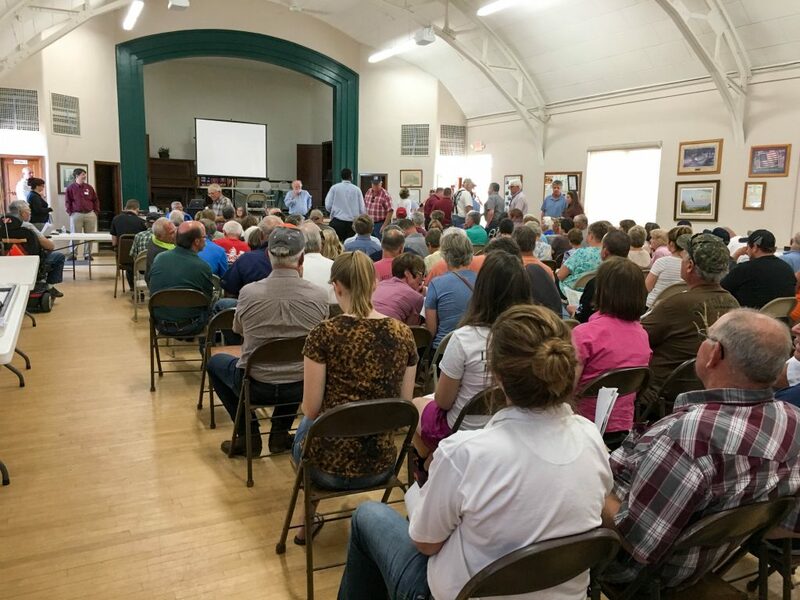 There are inconsistencies within the written Plan itself and between the written Plan and statements by Corps representatives at the Nelson meeting. 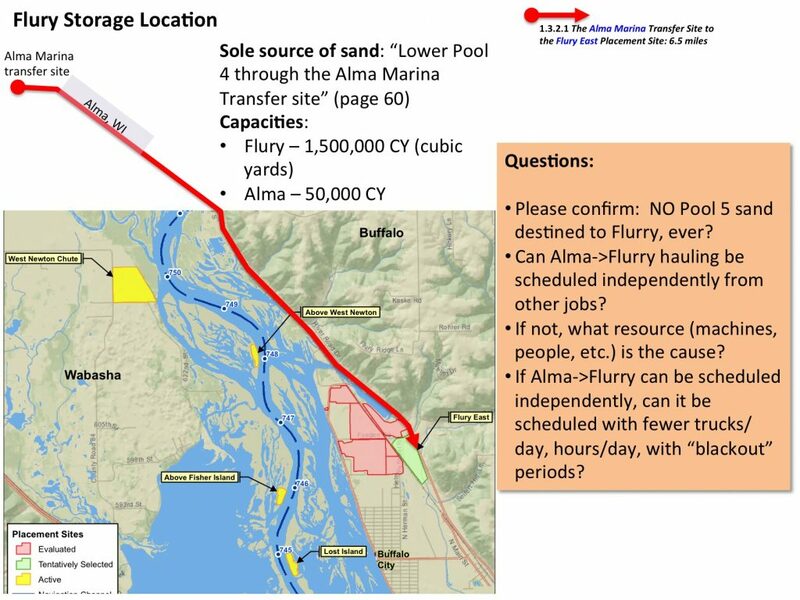 The Plan says the Flury site will accommodate all the dredge material unloaded at Alma. The Plan also says that some material will go north from Alma to Weisenbeck. Corps testimony said material from Wabasha would go to Flury. Without some clarity and consistency it will be difficult for local governments to plan for traffic. The Plan says one of the benefits of the Weisenbeck property is that no railroad has to be crossed to get to it. Someone missed a double track on the route. Corps representatives at the Nelson meeting placed great emphasis on “least cost”. The Plan provides only total cost numbers and no supporting information that would allow any reader to evaluate the accuracy of the Corps’ conclusion that the recommended sites are indeed the “least cost” sites. The Corps representatives also testified that “social considerations” were taken into account and used as a tie breaker only when two sites had the same “least costs”. The Plan provides no information as to what social costs might have been taken into consideration or how they might have been evaluated and used in any particular decision. There is no clarity and no way for the reader to make an independent judgement about the Corps’ evaluation and conclusions. Using social considerations only as a tie breaker between sites with the same dollar costs also rules out the possibility of ranking a higher cost site with few social costs as preferable to a lower cost site with high social costs. The Plan does not mention nor take into account the Federal and State statutes and local ordinances that restrict land use along and beside The Great River Road. There is other evidence that whoever was responsible for writing the Plan was not familiar with the area. The swans and the tourists at Rieck’s Lake are mentioned even though there have been no swans or tourists since the Lake was dredged almost ten years ago. At the same time there is no mention of the hundreds of motorcycles that run the county roads and fill the streets of Nelson and Alma every weekend from May thru October. The Plan takes into account railroad crossings and left turns and old cultural artifacts, but doesn’t mention the lives, plans, family history and the use of the land the Corps wants to take. The Plan ties the timing and scheduling of truck traffic to when “dredge crews normally operate” – regardless of normal traffic patterns, or the hours when residents might be least inconvenienced. There is no evidence in the Plan that the Corps has taken into account the effects a large sand pile in the neighborhood will have on the value of neighboring property or the quality of life now enjoyed by neighbors. The Plan doesn’t commit the Corps to any particular action. The word “likely” is used quite often in describing the intentions of the Corps. The uncertainty makes it difficult for residents and local governments to plan how to cope with the Corps’ activities. The Plan closes by justifying the taking of prime farmland because there is “lots of farmland”. The words are reminiscent of what was said in the past: there are lots of forests, lots of buffalo, lots of passenger pigeons, lots of cod in the oceans, lots of shrimp in the Gulf. The draft Plan calls for a public hearing on the draft Plan. When asked after the Plan was released if there was going to be a public hearing a representative of the Corps replied that no public hearing was planned. 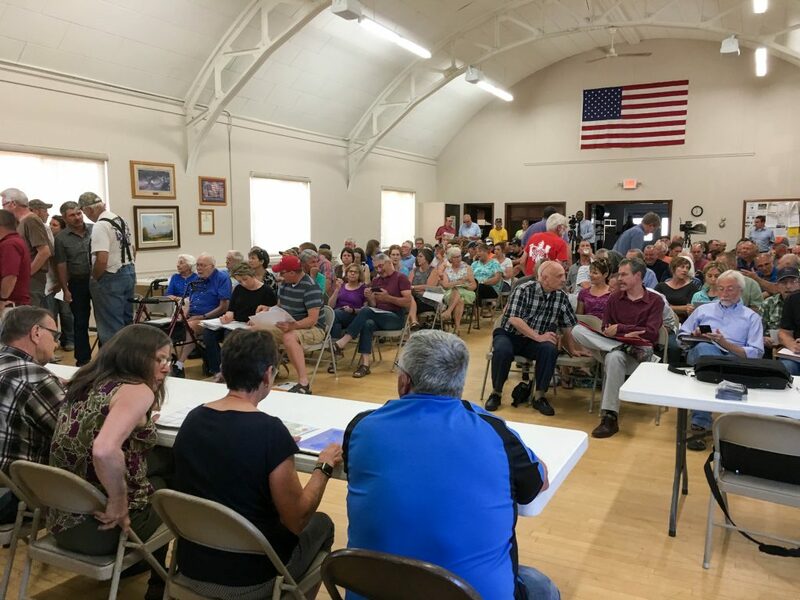 The Corps agreed to attend the public hearing in Nelson only after the Buffalo County Board of Supervisors scheduled the meeting and posted a notice that the Corps had been invited to present the Plan and answer questions. If the Corps wasn’t going to keep that first commitment, how can residents and local governments rely on any of the other commitments in the Plan? For all of the above reasons we urge the Corps to reject this Plan and restart the planning process and engage residents and local governments in the discussions from the beginning. The Plan will affect our lives and our communities for the next 40 years. We should be consulted and kept informed throughout the drafting process. Secrecy only undermines confidence in the product. Signed by all members of the Buffalo County Board of Supervisors. This is the series of slides that I submitted as my testimony today. My goal was to pose questions that the Corps could consider and respond to. Click on the slides for bigger versions. Since the deadline has been extended, feel free to steal any of these ideas and use them in your own testimony. 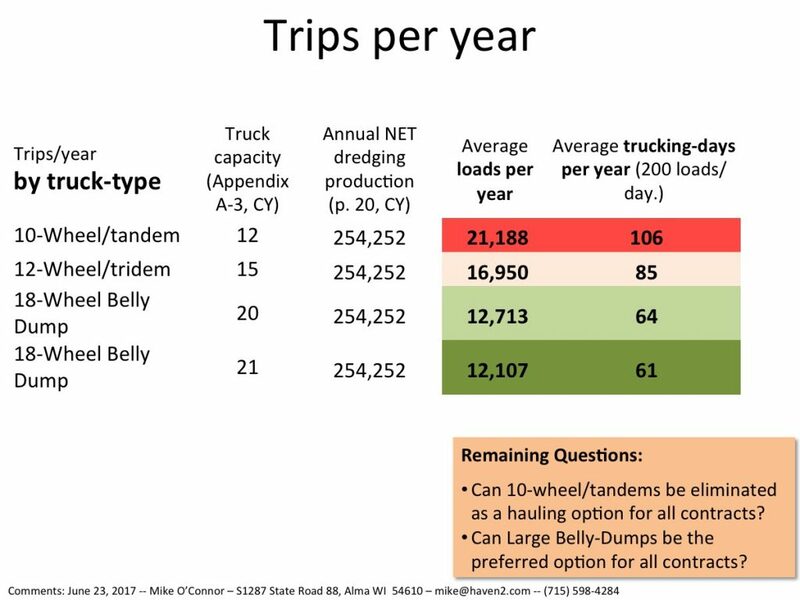 Slide 1 — you’ll see in later slides that I’ve revised my calculation for truck trips after a phone conversation I had with folks at the Corps. I realized afterward that there’s still a puzzler because during the phone call they said that all the dredge sand is either going to the Carrel’s site or the Alma Marina site, depending on which half of the pool the sand comes from. So I’m wondering how much sand actually goes through the Southside Fitzgerald location. 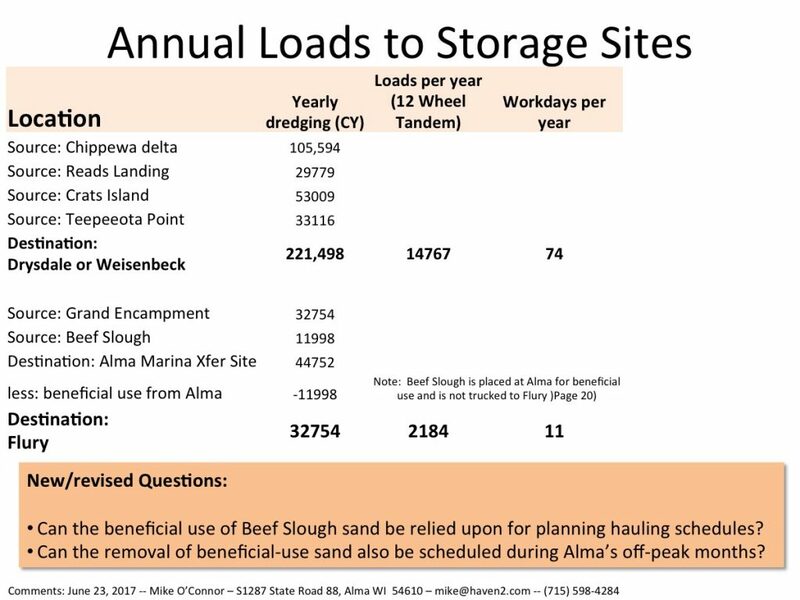 Slide 2 — the big news on this slide is that the Corps is also working on a plan for Pool 5 and there may be more sand moving to shore around Buffalo City. Buffalo City folks will want to keep an eye out when that plan is published. I have a few questions here that you may want to ask too. Slide 3 — Nelson folks will want to pay attention to this one. During the phone conversation the Corps mentioned that the sand headed for Weisenbeck (and thus, through Nelson) will be hauled one year out of four. More on that in later slides, but again the Southside Fitzgerald route puzzled me. Slide 4 — The Corps mentioned that there will be an operational plan that is where questions of hauling and scheduling will be resolved. 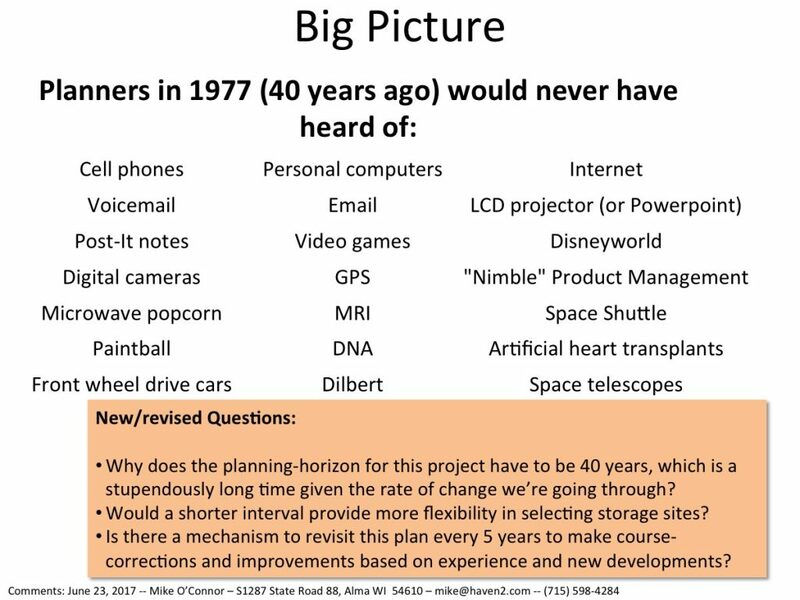 This slide captures some of the highlights of that conversation (especially the possibility that it may be possible to schedule Alma to Flury hauling in a way that avoids the peak tourism months in Alma). 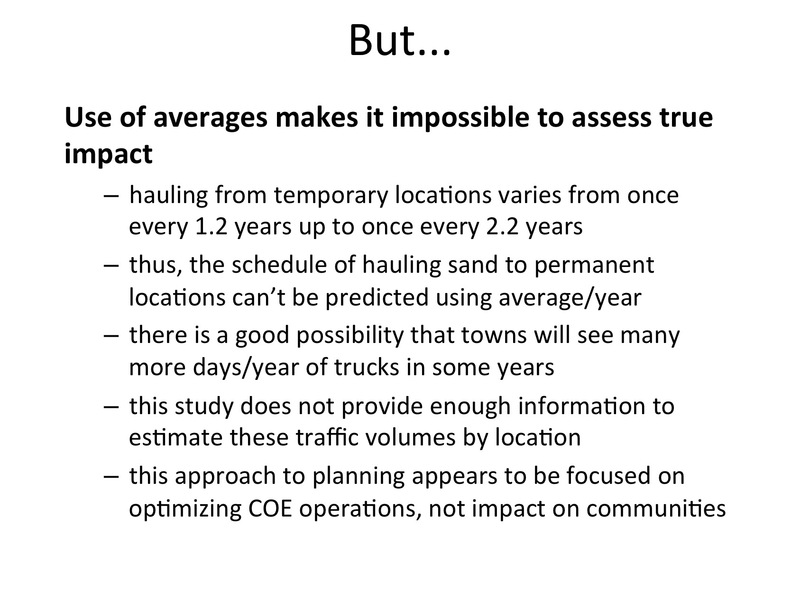 Slide 5 — the Corps folks and I agreed that my original calculations, based on averages of averages weren’t really much use in predicting truck trips through towns. These next few slides are hopefully a better approximation. This one is the same as my last attempt — but I left the phone conversation with a couple unanswered questions. 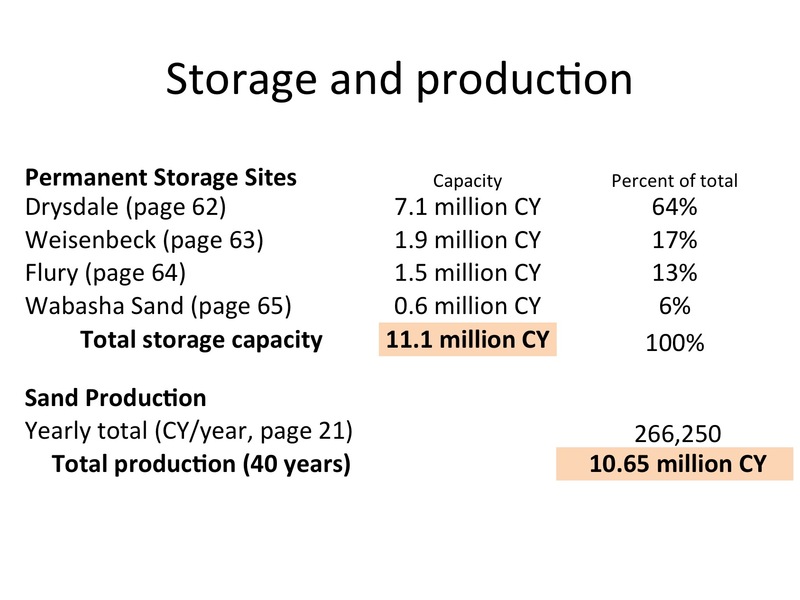 Slide 6 — this is a new analysis, based on dredging production estimates rather than storage location capacity. I like this approach better. I have a few questions about how Beef Slough sand is handled. Slide 7 — Here’s the payday slide. 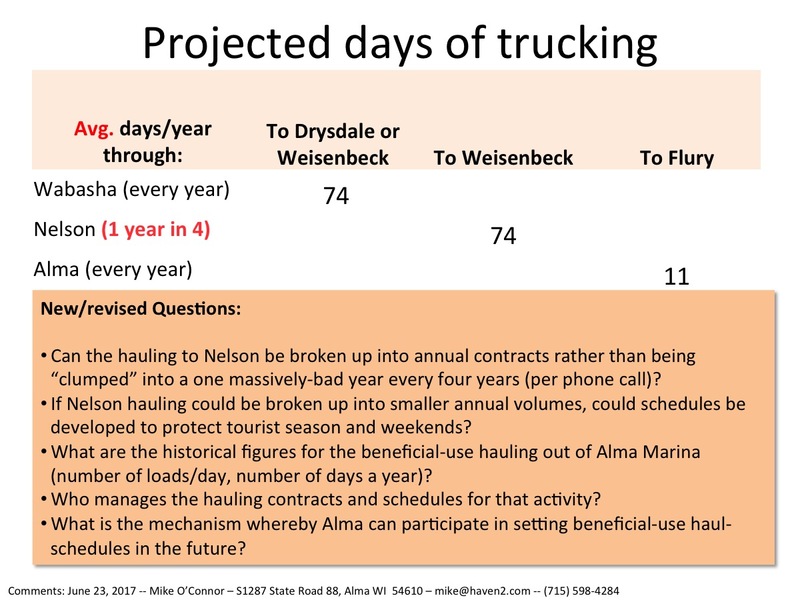 Given my better understanding of what’s going to happen, Nelson is going to have a “burst” of heavy truck traffic one year in four, Alma and Wabasha are going to have roughly the same annual traffic as my last analysis. Again, a few new questions came to me. Slide 8 — now it’s time to step back and spend a couple slides on broader issues. This one is about the 40-year planning time horizon which seems awfully long to me. Slide 9 — final slide. I, like many, wonder whether the Corps is really looking broadly enough at the true value of the sand that they’re processing. 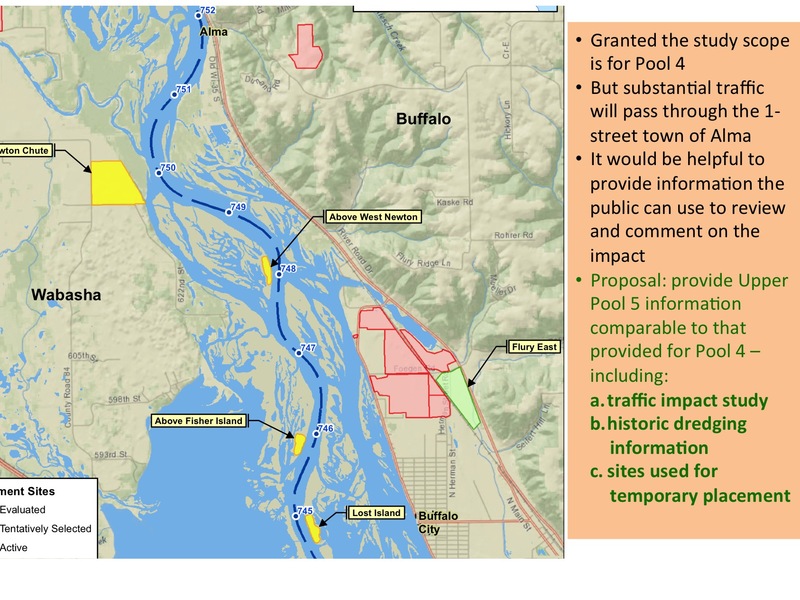 The Buffalo County Board of Supervisors held a special meeting in Nelson last night to take testimony about the Corps of Engineers dredge-sand proposal for our area. I recorded the meeting (all 3 hours and 13 minutes of it) and you can listen to the recording by clicking HERE. I took a couple pictures about 10 minutes before the meeting started. It was a standing-room only crowd by the end. 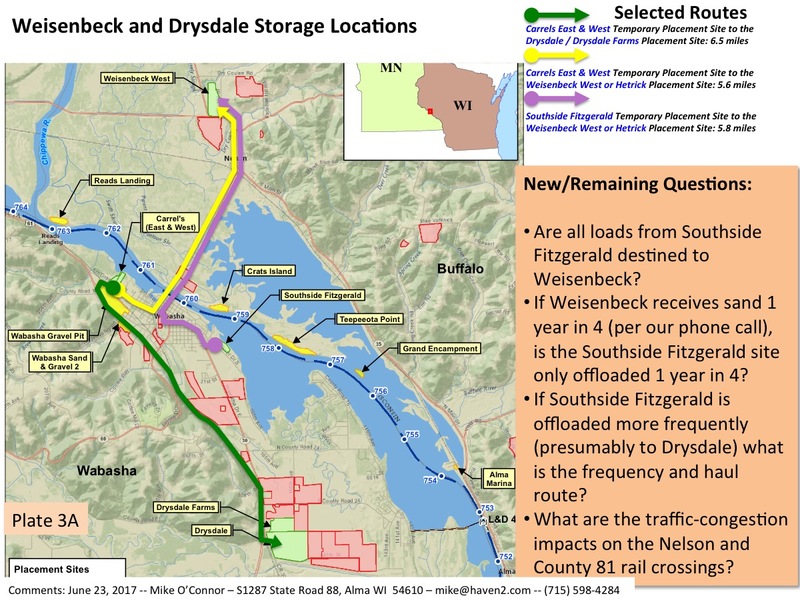 UPDATE: There’s a special meeting of the Buffalo County Board on Tuesday, June 6th at 7pm in the Nelson Community Hall (S105 N Main Street, Nelson, WI 54756) to discuss this plan. Representatives from the COE will be there. UPDATE: I’ve revised and corrected the slides in this post in anticipation of the meeting. Click HERE to download the updated slides in PDF format. Especially aimed at those of you planning to attend the public hearing in Nelson. 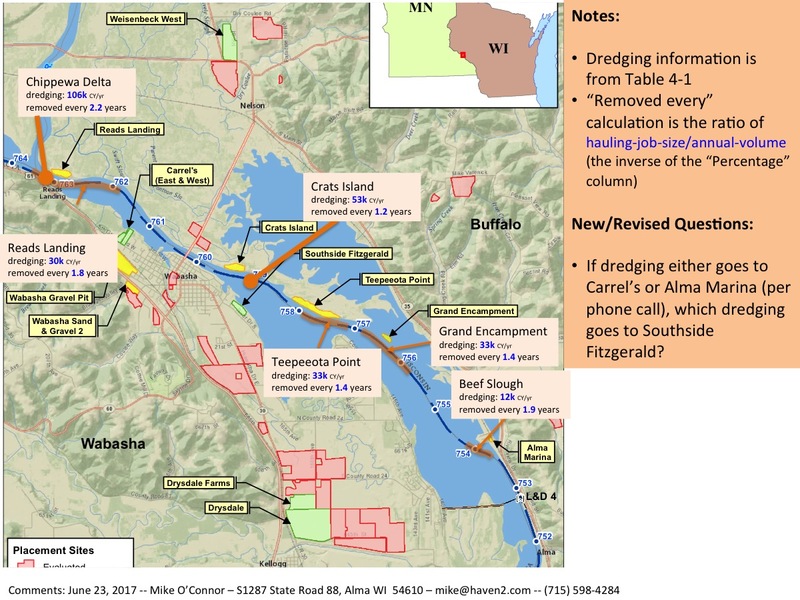 The Army Corps of Engineers has released a report describing their proposed 40-year plan for disposing of dredge sand in our area. Here’s a link to the planning document. Note that public comments are due by June 9th [UPDATE] June 23rd [UPDATE-2] July 14th Instructions for submitting them are on the site as well. I decided to focus on truck trips through our one-street river towns. I want to be clear, there are other issues with this study (e.g. 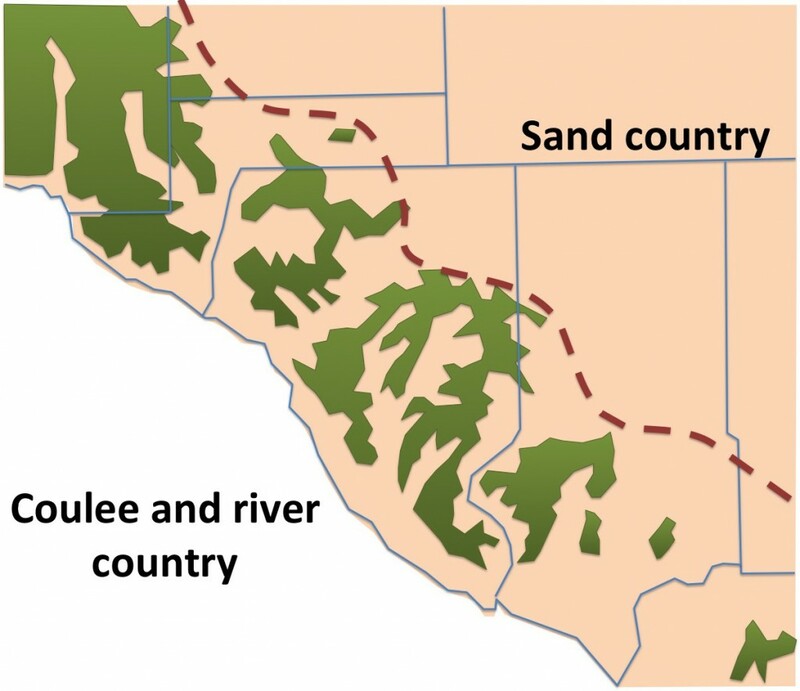 the unsustainable model of converting farm land into dumps for river sand — 200 years of that and we’ll look like the Sahara Desert around here) but I’m leaving those conversations to others. Truck trips, that’s my bag. This report was confusing me, so I made some pictures to understand it better. I’m hoping they will help you too. This first one summarizes the dredging activity in Pool 4 — which is the focus of this plan. 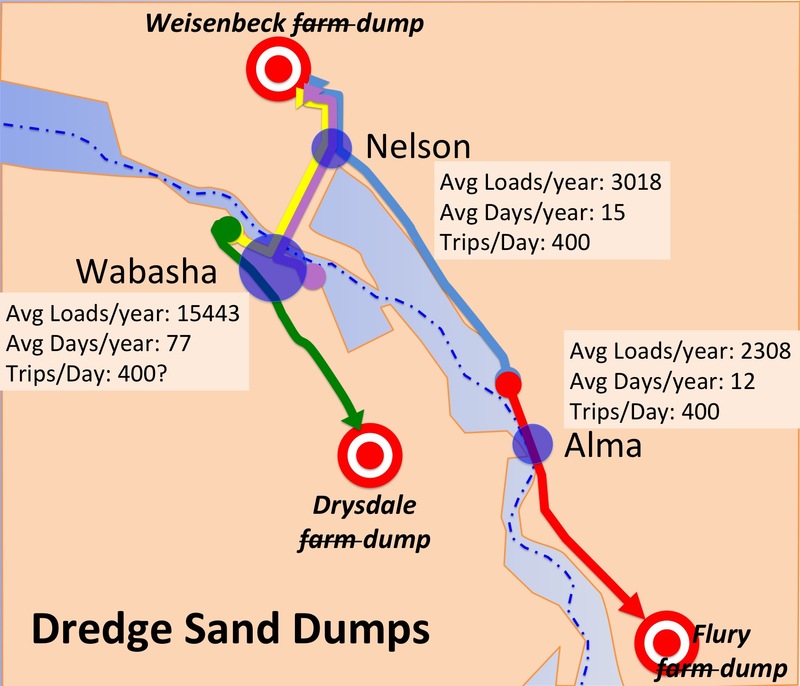 I’ve added little boxes that show where the dredging locations on the river, how much sand they typically produce every year and how often that sand is hauled from the pile of sand on shore to a storage location. Note my questions. This report has a lot of holes in it, so I can’t trace where the sand goes from end to end, nor can I tell how often those projects happen. The questions down the side are partly documenting those puzzlers as I encountered them and partly advocating things to do. As with all these slides, click on it to get a full-sized version. The next slide is my attempt to create a similar picture for the pool to the south — but that information isn’t in the report. I’m very interested in promoting and protecting the Great River Road and wanted to see a traffic impact study of the trips through Alma. But the scope of this study is only Pool 4, not Pool 5 and so they didn’t develop a lot of the activity information shown in the first map. I gently disagree with that approach, since that information is really important to evaluate what happens to Alma and the Great River Road. This slide highlight the haul routes proposed/preferred to move sand in and around Pool 4. They’re pretty well documented in the report, but the information is scattered and I just pull it together. Note that I think there’s an error, however. 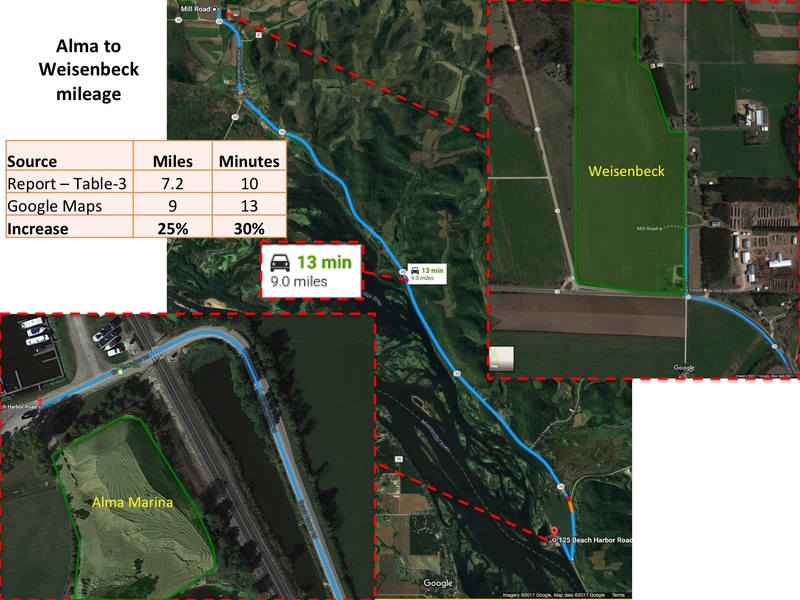 Here’s a slide to document my conclusion that they got the distance between Alma Marina and the Weisenbeck farm wrong. It’s a pretty substantial difference, but as far as I can tell I don’t think they’re planning to use that route much. 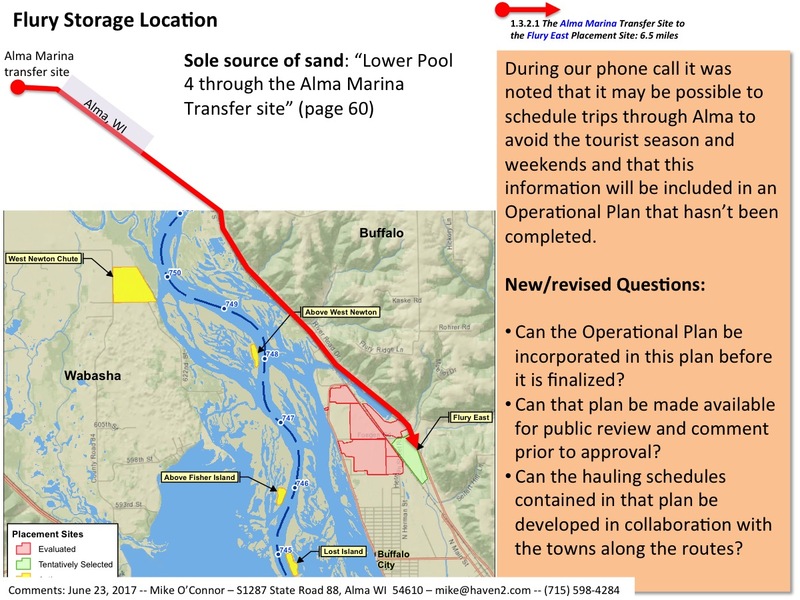 Unfortunately there are inconsistencies in the report — some places state that sand will only go south out of Alma Marina, other places state it will go both ways. And sketchy documentation of frequency and volume. 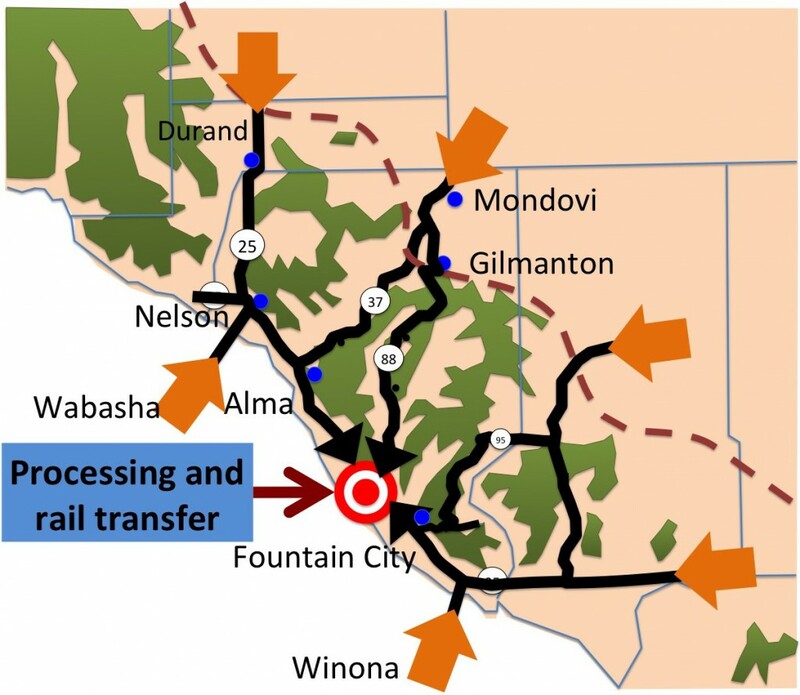 This second haul-route slide creates information by guessing a few things, because this route is not as well documented in the report (especially painful is the lack of a Traffic Impact Study). This is my best guess, given what’s there. The next series of slides is trying to arrive at the answer to my main question — which is “how many truck trips and when will they happen?” As you’ll see, the methodology used in the study makes this question impossible to answer accurately. The best I can do is to document yearly averages, which isn’t satisfactory because it’s possible that a town will see huge swings from year to year. Unfortunately the report splits the analysis between total production and destination-capacity in a way that contributes to the difficulty in arriving at an accurate projection of traffic on routes. And the numbers are also spread throughout the report. Here is where we start. 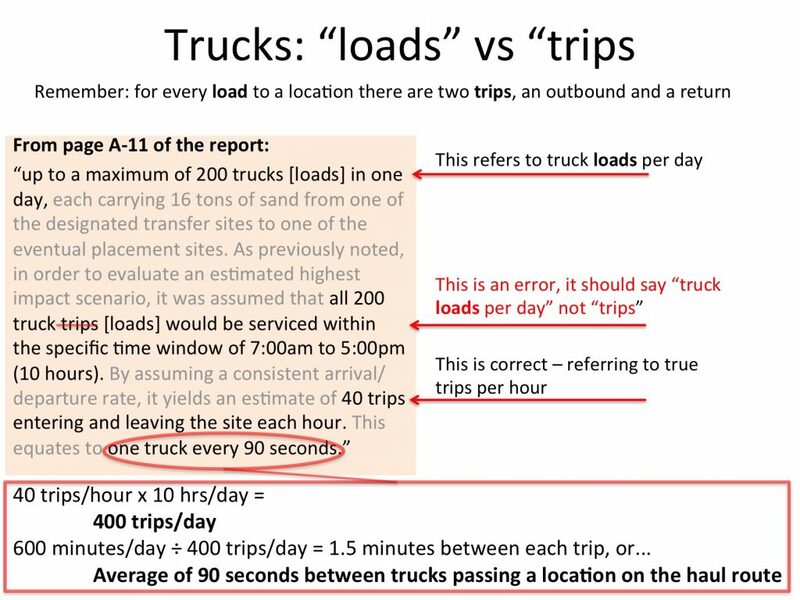 Here’s a discussion of our old friends “loads” and “trips” which I stuck in because there’s an error in the report that confuses those two terms and I wanted to make sure that their “90 seconds between trucks” estimate was right. It is. 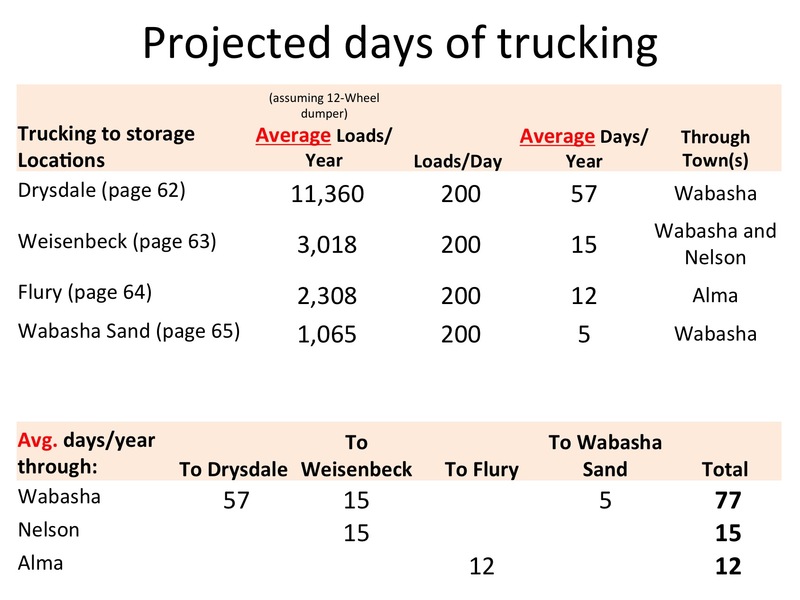 Here is my calculation of the total trips per year (by looking at the amount that will get hauled in an average year, the capacities of the trucks and where the sand is going). Note that top table of numbers is based on estimates of annual production but the trips are spread across the locations based on location capacity. I’m not happy using two different measures, but that’s the way the report did it. Again, these numbers are averages and will vary wildly from year to year depending on where dredging needs to be done. I’ve color-coded the numbers to point out the difference the size of the trucks makes in number of trips. This will matter to the people along the haul routes. This slide documents how many of trucking-days a given town is going to experience. This is where things really start to get shaky, because of the heavy use of averages in the report. The reality in a given town will differ wildly from these numbers in any given year, because of the way the Corps of Engineers schedules and manages their work. So these numbers should be treated with great skepticism. 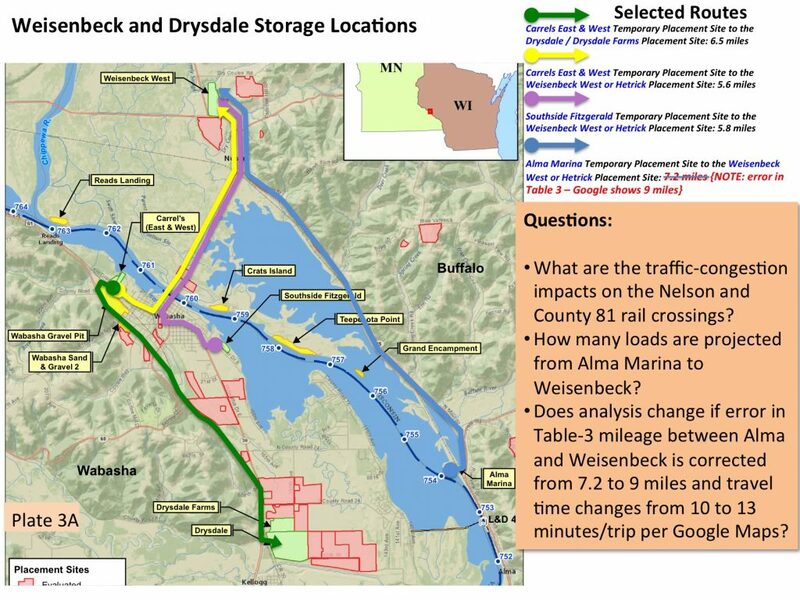 Note: Wabasha has three haul routes which run through it, that’s why the three numbers are added together. And finally, here’s my rant. After spending all that time digging pieces of information out of various places in the report, I realized that I was producing bogus conclusions about traffic volume and making this plan sound more manageable than it really is. In reality, the Corps makes absolutely no promises about the maximum number of truck trips through a town, or when those trips will happen. So businesses along the route are at risk of very unpleasant surprises all summer.